Do you like the Crystal Prep Shadowbolts? Do you like stories with romance in them? Do you like a grittier and more realistic (and cynical) take on Equestria Girls? Then you might want to have a look at the story below the break. I think you'll like what you find. And no, it's definitely not the Shadowbolts Adventures series, if that's what you guessed by who's doing this promotion. Is it April again already? Because this new site update is a joke. Edit: Okay, it's not a complete joke. There's actually a lot of good stuff in this new update. Bugfixes and cool stuff galore. Buuuut there are also some not-so-good changes, and the flood of new code seems to have broken... everything, at one point or another. Is this from the next coming epsiode? 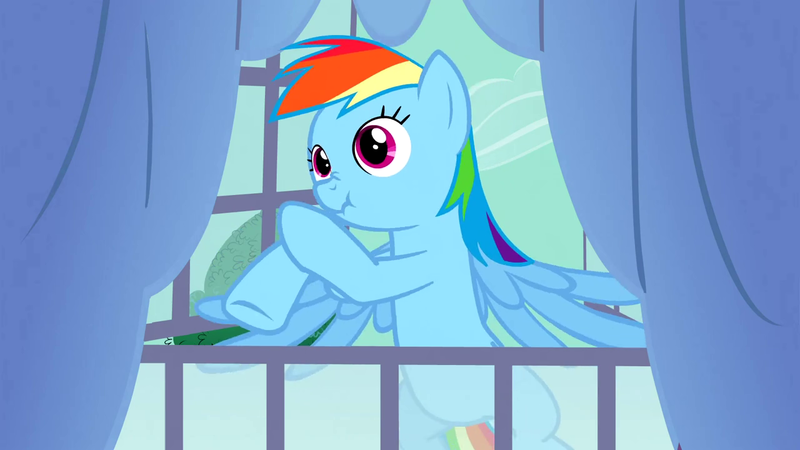 It's from back in Season 3, in Spike at Your Service, when Dash was hanging outside Rarity's window. I just stumbled upon this frame today. I can't believe I never noticed it. That is hilarious. Can we call this a 4th wall break? Cause I think Dash just realized she's part of Flash Animation. Also, her face just screams "What have I done!?"